Food comes in all kinds of shapes, sizes, and packages. Your kitchen cabinets, pantry drawers, and refrigerator shelves are already filled with marvelous little boxes and baggies of goodies. Some of these are cultural icons, others are silly modern wonders of neo-retro design. You may even have your own little collection of interesting little containers in the form of left-over little boxes of candy from Halloween. What can you do with all these things? 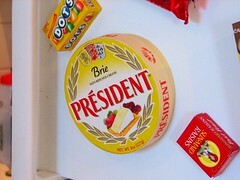 Make them into an awesome array of fridge magnets! This is what lives on our refrigerator: A collection of, well, things. 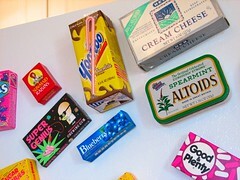 There are boxes of cream cheese and raisins, a tin of Altoids, a wheel of brie, and various types of chewing gum. There are sippy-boxes of yoo-hoo. 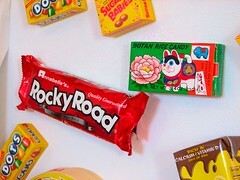 There is rice candy, a squishy Rocky Road bar, and there are boxes and boxes of Dots. 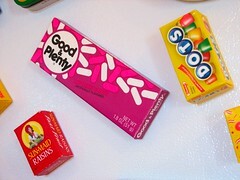 And then there is the slightly odd trio of Nerds, Good & Plenty, and Sugar Babies. You can make magnets like these yourself. The first step is to pick some appropriate boxes to use. Most anything will work. Things that are small, recognizable, and come in (large sets of) small packages are a good choice. Right after halloween is a particularly good time of year for little boxes of things. Depending on your age, you’ve probably just been out trick-or-treating, or at home handing out little boxes of things to trick-or-treaters, so you may already have some cute boxes on hand. Even if you haven’t gotten involved in the sugarfest, it may not be too late; you can sometimes find discounts the week after Halloween. Beyond the box, you’ll also need some magnets and some glue to hold the magnets in place. I used magnets extracted from plastic toys and hard drives. For small, light boxes (like most of these), one of the little magnets from plastic toys is fine. If your box is bigger, needs to hold more to the fridge, or you just like overkill, it’s good fun to use one of the monstrously strong magnets from an old hard drive, preferably still attached to the bracket. 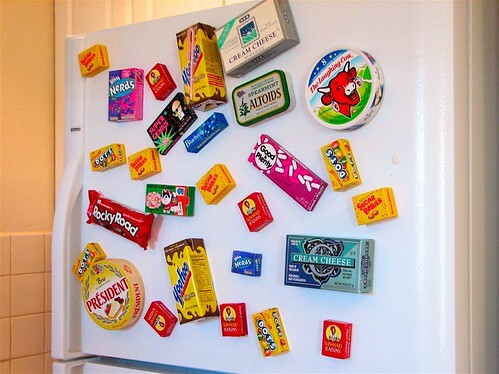 There’s one of those in the Yoo-hoo magnet, and it takes a lot of work to get it off of the fridge. If you’ve chosen to use a mint tin or other ferromagnetic box, your life will be easy: Just drop your magnet(s) in the box, shut the lid, and stick it to the fridge. Otherwise, welcome to the trickiest part of the project: Opening your boxes without making it look like they’ve been opened. If you’ve got large boxes, like the cream cheese box shown here, start with those. 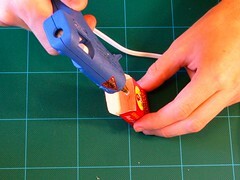 Most cardboard boxes used for packaging are assembled with glue. Find a flap that’s held down by glue. 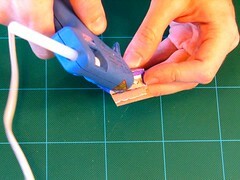 Using a sharp knife, carefully cut through the glue that holds one of the flaps down. Be sure to not bend the flaps as you open the box this way. 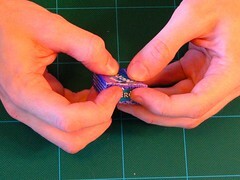 Remove the contents of the box, drop in a magnet, and glue it in place. A hot glue gun is great for this. Drizzle in a little hot glue, and drop the magnet in on top of the bead of hot glue. Quickly place the box on a horizontal ferromagnetic surface (like the top of the fridge) so that the magnet is pulled down, flat against the side of the box and is then held in place when the glue cools. Optional extra step: Once the magnet is in place, add some weight to the box. Dried pinto beans are cheap and are the right size to substitute for many candies, such as sugar babies. For less rattly things like Dots or raisins, you can use additional hot glue to hold most of the beans in place. That one in the middle that rattles adds a lot of realism! 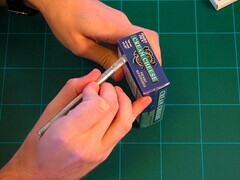 It can be a little bit tricky to seal up the box without making it obvious that the box has been opened and resealed. Your best strategy is to try and put a small drop of hot glue exactly where the original glue was, right beneath that flap that you cut open. If you do this correctly, it will leave no trace whatsoever that the box has ever been opened. Once you’ve put that last drop of glue in place, fold down the flap and firmly hold it in place until the glue is cool, around one minute. That’s it, stick ’em to yer fridge. Make lots of them. Give them out as party favors. Give them out as birthday presents. Come up with new varieties. Completely cover your fridge. If you are devious, mix them in with real candy and confuse the heck out of everyone. It’s up to you. Let us know what you’re building! If you have any good suggestions for other objects to use, or maybe even a link to photos of cool magnets that you’ve made, you’re welcome to leave them as comments. Further (future) reading: We’ve written another story about making magnets like these, focusing on the construction details of a few specific examples of these magnets. It will be published in The Hungry Scientist Cookbook, forthcoming from ReganBooks at HarperCollins in September, 2007. Until then, you can hang out with the Hungry Scientists in their group on instructables. This entry was posted in EMSL Projects and tagged diy, magnets. Bookmark the Permalink. That rocks. I have a blog dedicated to glue gun crafts and I’ll be posting about this one today! I didn’t know anyone else ever ate recursive LOL cow cheese! That is the coolest idea ever. I think I will use them for birthday gifts and party favors. THink this is a great idea. Think some more work needs to be done with cardboard boxes though as im sure they get a bit weak over time. maybe some expanding foam would do the trick? I’ll be trying this with a box of my favourite imported sweets from the US…..Milk Duds.